How many times have you thought or said that to yourself? If your answer is greater than one, you’ve probably said it (WAY) too many times. You see, most people say they’re tired of being broke, but they’re really NOT. Most people fantasize about being rich, but waste valuable time day to day, month to month, year to year. They’re too busy messing around with their smart phones, apps, gadgets, social media, and gossiping about people that are living a lifestyle they desperately wish they could emulate… all unconsciously. Look, I know that might sound brash, maybe even judgmental (and I’m not one to judge because when the shoe is on the other foot it’s not cute), but there’s a reason for me getting this point across to you. If your reading this article, I would bet a BILLION DOLLARS, you want to make MORE MONEY. BUT…you have to make a decision. YOU can CHOOSE to be a woman that taps into her creativity AND gets $hit done – not a consumer of other people’s stuff. It’s what you were “programmed” to do. It’s how you were made. Creativity followed by action is what it takes to raise your money vibration. Ooh…you know I love getting “Woo Woo”…not to mention I stand firm behind my Metaphysical existence. PoshONPennies® is not about living in poverty. That was never my intention. NO WAY! We wish to inspire you to be a smart business woman, a #GOALDigger and having more financial sense than fashion sense (I’ll be working on that for the rest of my life). We were never taught how to make money. I don’t recall in high school and my friends that attended Ivy League schools like Yale, Pepperdine, Harvard, USC and UCLA would agree, they too weren’t taught how to make money either. So, if you’re tired of being broke. You have to develop the habits of a woman that fills her wallet with dollars every day of her life. How do you develop good money habits? You have to be willing to let go of poverty thinking, fill your days with income producing activities and commit to raising your financial IQ and wealth consciousness. For instance, are you willing to spend less time watching Netflix or browsing Facebook, Pinterest and Instagram—or whatever you enjoy doing that consumes way too much of your time? Are you willing to read a book about money management or take a course to learn about how to save money or invest it if you should so desire? Are you willing to study mindset principals so you can deal with your money problems at the core and get off the financial roller coaster for good? Are you willing to pick up the phone and make sales calls? Are you willing to send out your resume a 100 times a day via Craigslist, Linkedin, or Indeed until you land a job? Are you willing to develop your skills or learn a new trade? Are you willing to get a mentor or join a mastermind (accountability is a success insurance policy)? Are you willing to take a part-time job while you’re in between your dream job or dream career? Are you willing to stop making excuses, take responsibility, swallow your pride and do whatever it takes to take control of your financial future? For All The Girls That Are BUSY AND BROKE: Are you willing to stop wearing ‘BUSY’ as a badge of honor? Note: If you’re broke and busy something is wrong. You need to manage your activities…forget time. If it’s not income producing, for the love of your bank account, STOP! 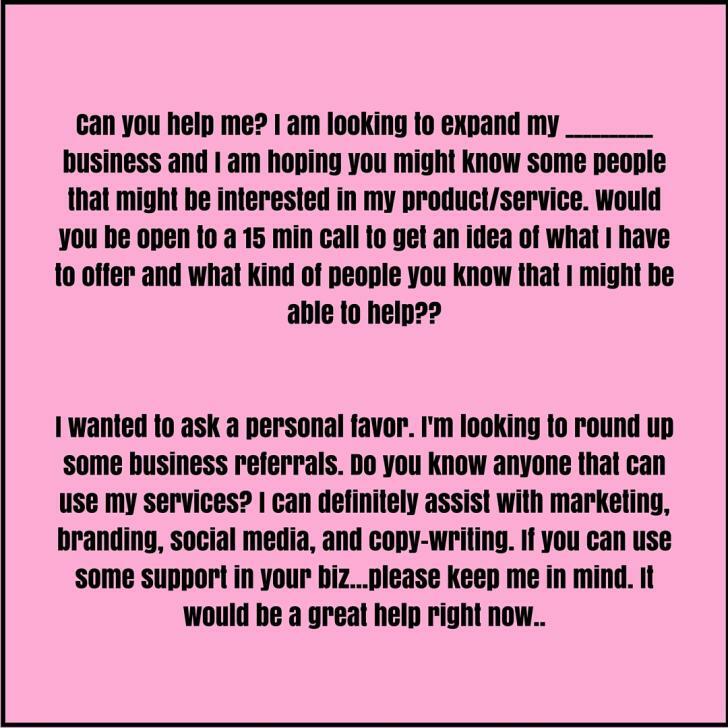 Are you willing to send out a text message asking friends, family and business associates if they would refer you to people in their network that might need your product and/or services? Here’s a prospecting text I drafted for a client, and the exact text I used several years ago when I experienced financial hardship back in 2012. If you have a viable skill and are in a business that solves a problem it shouldn’t be difficult getting a dozen referrals. So…if you’re tired of being broke. Take action, implement, execute and you will see results.